To analyze our surgical experiences with surgical ventricular restoration (SVR) for dilated ischemic cardiomyopathy (ICM) and to determine the significance of preoperative right ventricular (RV) function on outcomes. This study retrospectively analyzed 19 patients who underwent SVR between April 2010 and May 2016. Their mean age and New York Heart Association functional class were 62 ± 11 years and 2.9 ± 0.8, respectively. 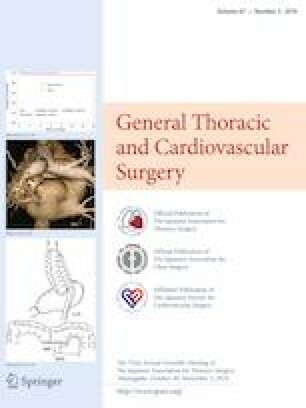 The preoperative mean left ventricular (LV) end-systolic volume index and LV ejection fraction (LVEF) were 134 ± 56 mL/m2 and 24 ± 7%, respectively. The preoperative mean RV fractional area change (RVFAC) to quantify RV systolic function was 33 ± 13%, as assessed by transthoracic echocardiography. The mean follow-up period was 47 ± 20 months. Three patients died of cardiac causes during the follow-up, with the 3-year and 5-year freedoms from cardiac-related death of 89% and 79%, respectively. Major adverse cardiac events (MACEs) occurred in ten patients, with the 3-year and 5-year MACE-free survival rates of 58% and 41%, respectively. RVFAC (risk ratio [RR] = 0.92, 95% confidence interval [CI] 0.86–0.98, p = 0.01) and LVEF (RR = 0.83, 95% CI 0.68–0.97, p = 0.02) were significant predictors of MACEs in the multivariate analysis. Patients with RVFAC of < 35% had significantly poorer MACE-free survival rates (33% at 3 years) than those with RVFAC of ≥ 35% (80% at 3 years). SVR for ICM provided acceptable freedom from cardiac-related death; however, MACEs commonly occurred and was associated with RV dysfunction. We thank Editage (http://www.editage.jp) for the English language editing.